This week, I wrote my first twitterbot. For a while, I’ve been interested in Twitter robots – not spambots that auto-follow everyone who mentions Justin Bieber, but those that do something interesting with language or online data, such as Metaphor-a-minute, which uses the Wordnik API to generate random metaphors, or Library of Aleph, which tweets captions (without the photos) from the Library of Congress’s photo collection. Who put the bomp in the bomp, bomp, bomp? A single line from a song can also be rich in memories and connotations. I now had my idea for my twitterbot. There are a ton of “how to” options online. Because I want to learn more about Node.js, I chose this tutorial from Christian Paulsen to create the basic structure and functionality of the twitterbot. Next, I needed questions. I put out a call on Facebook for my friends’ favorite questions from songs and ended up receiving more than 150 suggestions. I put all these into a text file and created a script that selects a random line and posts it on Twitter. If you’re interested in this sort of thing, I put the script on Github. To automate posting the questions to Twitter, I downloaded LaunchControl, a small utility that lets you create and edit automated tasks on a Mac. Technically, LaunchControl just provides a GUI for Mac’s launchd process – see more here – but it makes launchd’s fairly confusing format much more readable. I have the script scheduled to run every three hours at the moment. This process isn’t perfect – it runs whenever our computer is being used, but not if it’s asleep or off. So one of my next steps is to convert an old Mac into an always-on home server that can (among other things) run the Twitterbot 24–7. I’d also like to make the posting a bit less random by avoiding repeated questions too frequently or grouping some multiline questions together. Overall, the project was very fast (started on Thursday night, finished by Saturday morning) and tremendous fun, and I’m collecting ideas for other bots. I’d like to try pulling texts from an API or a public domain source (Book of Common Prayer, perhaps?) for my next one. Oh, and be sure to follow Lyrical Questions on Twitter. When you’re applying for jobs, you find yourself entering the same information into online forms over and over again: work history, contact information, names, etc. A few forms allow you to import information from an uploaded resume or from your LinkedIn profile, but even these don’t always get all of your details correct. It isn’t easy to stay motivated during the job search, and entering the name and phone number of your supervisor from seven years ago for the 50th time doesn’t help any. This is where I use TextExpander to save time and stay focused. anywhere I need to type my cell phone number, and TextExpander changes the string into my number. Not only is “ccell” shorter than my 10-digit number, but it also takes less time to type on my non-number pad-equipped Macbook. There are more advanced features — I’ll cover one of them below — but you can read more at the TextExpander website. Note: TextExpander is a Mac-only program, though there is an iOS version for iPhone and iPad. There are similar programs for Windows, and if you use one that you recommend, tell me about in the comments. How does this work in practice? Let me share a couple of actual examples that I use for entering my work history. Perhaps this is more helpful to me than to other people, because I have a history of long job titles at organizations with long names. Let’s take one of my former positions as an example: Director of Foundation Services at the Cincinnati Better Business Bureau. expand to “Director of Foundation Services” and the CBBB’s main phone number, respectively. You get the picture. Snippets can expand to much longer text, too, so I could create Snippets for the CBBB’s address, my job description there, or even my full resume. and a small pop-up window appears. Click for a clearer image. Notice the blanks in the text. This is a generic cover letter, with spaces for the address, salutation, and some custom language about my experience and expertise. (Today’s date is automatically generated by TextExpander.) When I’ve filled in the blanks, I click “OK,” and the new text is inserted into whatever program I’m using. 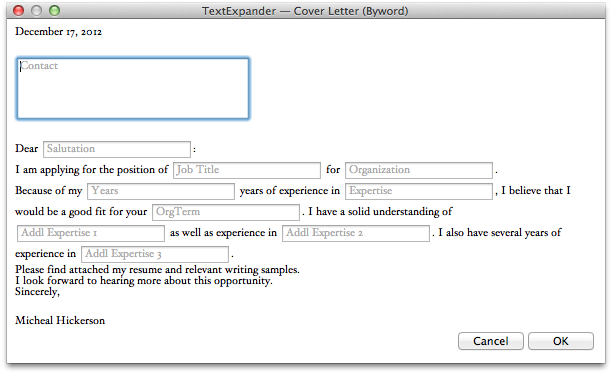 I’m still not done with the cover letter, as this is only a template to help get me started. But the hard work of getting to a first draft is done. Now I can revise, reword, and craft the cover letter to fit the specific position, much faster and much more easily that if I were starting from scratch each time. TextExpander is one of the three apps I immediately install on a new Mac. It syncs with Dropbox, too, so that my snippets travel with me from computer to computer. TextExpander offers several pre-defined snippets (e.g. special characters, HTML coding), and smart people like Brett Terpstra and David Sparks have created bundles of TextExpander snippets that are much better than anything I could come up with. TextExpander also allows scripting within snippets, enabling even more powerful shortcuts. One of my current favorites is a script snippet from Brett Terpstra that pastes in the current URL from Safari. Do you have any tips for speeding up job applications? If you use TextExpander, do you have any favorite tricks? Keith Blount, an unapologetic English atheist, [who] created the marvelous cultural artifact call Scrivener, a program which justifies the existence of the Macintosh computer all by itself and which made completing this project an unexpected joy. Digital technology manager with experience in product strategy, UX, development, and design. Speaks the languages of creative, technical, and client personnel, and loves research and data. Demonstrated success in leading projects from conception to launch, as well as expanding legacy products.